Mutual funds can be divided into two main classes: bond funds and stock funds. The stock funds can be classified into variety of categories such as US domestic equity fund, International stock fund, and emerging market stock fund. One of the divisions in international stock fund or global stock fund is foreign large blend funds. These funds are suitable for investment portfolio diversification. This article will focus on this category. Foreign large-blend funds invest in a variation of large international stocks. Most of these mutual funds divide their assets in more than 10 developed markets, including Japan, Britain (United Kingdom), France, Switzerland, Germany, Italy, and Netherland. They also may invest the rest in emerging markets such as Hong Kong, Brazil, Russia, Mexico, Korea, Indonesia and Thailand. These funds typically will have only a little assets invested in U.S. stocks (less than 20%). The Artisan International fund objective is to provide long-term capital growth. This Artisan fund invests mainly in developed markets but also may invest in emerging and less developed markets. Under typical market conditions, the fund substantially fully invests in common stocks and similar securities, and invests >65% of net assets in securities of non-U.S. companies (i.e. international stocks). There are no restrictions on the size of the companies in which the fund may invest. This Artisan fund is managed by Mark L. Yockey since its inception in December 1995. The fund has total net assets of $9.92 billion. The expense ratio of this ARTIX fund is 1.23% every year. This is a no load fund, means it has no 12b1 fee and no sales load fee. This fund is currently only available for brokerage account with $1,000 minimum initial investment. This top performer fund may waive the initial minimum under certain circumstances. The yield divided by this fund is 0.77%. Morningstar granted this fund with 3-stars rating as it has 11 years with positive return and 4 years with negative return. The best performance was in 1999 with 81.29% and the worst in 2008 with -46.96%. This fund has 7.28% YTD return. Currently this Artisan fund is available for purchase from 98 brokerages such as JP Morgan, Merrill Lynch, Vanguard, EP Fee Small, TD Ameritrade Inc, Common Wealth Universe, Firstrade, Ameriprise Brokerage, Fidelity Retail Funds Network, Pru Choice Investment, etc. There is no other class available for this fund. As of June 2011, the top ten holdings of this Artisan fund are Sands China Ltd (Hong Kong) - 4.5%, Nestle SA (Switzerland) - 3.5%, Anheuser-Busch InBev NV (Belgium) - 3.4%, Linde AG (Germany) - 3.4%, Bayer AG (Germany) - 3.0%, WPP PLC (United Kingdom) - 2.7%, Canadian Pacific Railway Ltd (Canada) - 2.7%, Baidu Inc (China) - 2.5%, Siemens AG (Germany) - 2.5% and Wynn Macau Ltd (Hong Kong) - 2.4%. 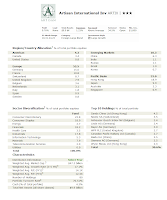 The top region allocations are Europe (52.5%), Pacific Basin (33.0%), Emerging Markets (10.3%) and Americas (4.2%). The Virtus International Equity investment seeks long-term capital appreciation. This fund offers investors exposure to primarily mid- to large capitalization international companies, but it is not limited to investing in the securities of companies of any particular size. 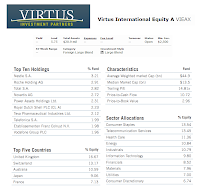 This Virtus fund invests majority of assets (>80%) in equity securities of issuers located outside the United States, including issuers in emerging markets countries. 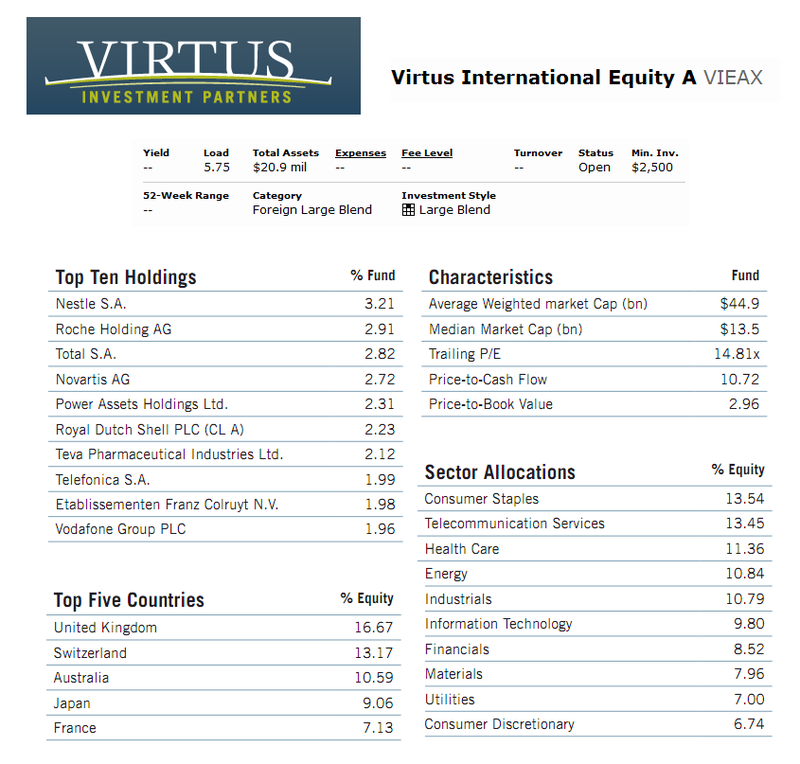 This Virtus International Equity was introduced to public in September 2010. Since this fund is new, it hasn’t gotten any rank from Morningstar yet. The fund currently has expense ratio of 1.5%. Tony Cousins has been managing this fund since its inception. Besides Tony, the other co-managers of this fund are Bruce Campbell, Paul Simons and Daniel McDonagh. The minimum investment needed for the brokerage account of this fund is $2,500 and $100 for retirement (IRA) account. The minimum subsequent investment is $100 for both types of accounts. This fund records 6.59% YTD return. This fund is now on the 1st rank in the Foreign Large Blend category. Currently the purchase of this fund is limited to 4 brokerages only (LPL SAM Eligible, Raymond James, Raymond James WRAP Eligible and Waddell & Reed Choice MAP Flex). More details about best brokerage; please check my Best Brokerages 2011 page. Investor can choose from the other classes of this fund, such as Class C (Ticker: VIECX) or Class I (Ticker: VIIEX). The top ten holdings for second quarter of 2011 are Nestle S.A. (3.21%), Roche Holding AG (2.91%), Total S.A. (2.82%), Novartis AG (2.72%), Power Assets Holdings Ltd. (2.31%), Royal Dutch Shell PLC (CL A) (2.23%), Teva Pharmaceutical Industries Ltd. (2.12%), Telefonica S.A. (1.99%), Etablissementen Franz Colruyt N.V. (1.98%) and Vodafone Group PLC (1.96%). The top five countries of this Virtus fund are United Kingdom (16.67%), Switzerland (13.17%), Australia (10.59%), Japan (9.06%) and France (7.13%). American Century International Core Eq. The American Century International Core Equity fund is seeking long-term capital growth. This fund invests majority of assets (>80%) in equity securities. It invests primarily in securities issued by companies located in developed countries and emerging markets. Equity securities include common stock, preferred stock, and equity equivalent securities, such as convertible securities, stock futures contracts or stock index futures contracts. 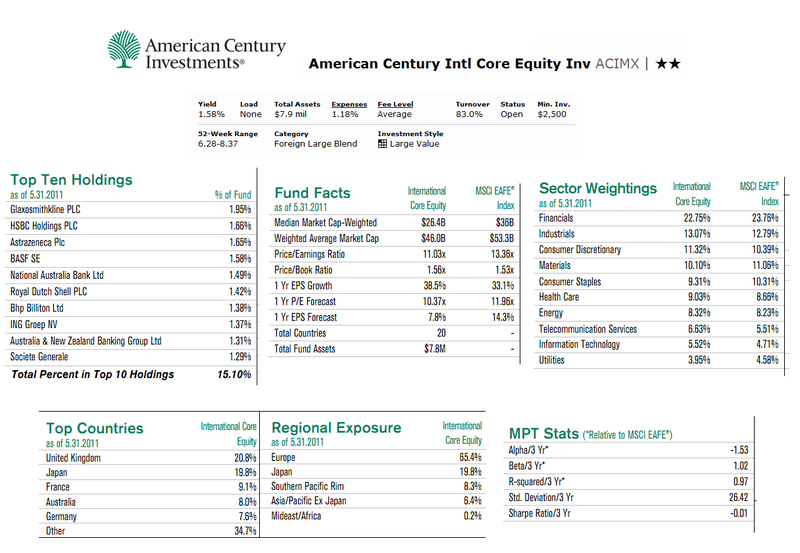 This American Century International Core Equity Investor fund has been managed by Armando J. Lacayo since August 2010. This American Century fund has 1.18% annual expense ratios. The annual holdings turnover rate is 83%. This ACIMX fund is a no load fund. The minimum amount needed to open a brokerage account or IRA account of this fund is $2,500. This fund currently distributes 1.55% dividend yield. Since the fund’s inception in 2006, it has performed in 3 years of positive return and 1 year of negative return (in 2008 with -43.243%). This fund has 2-stars rating from Morningstar. This fund has 6.44% YTD return. It has returned 21.26% over the past one year and -2.49% over the past three years. This fund is available for purchase from 55 brokerages. The other classes of this fund are Class A (ACIQX), Class B (ACIJX), Class C (ACIKX), Class R (ACIRX) and Institutional Class (ACIUX). As of May 2011, the top ten holdings of this fund are Glaxosmithkline PLC (1.95%), HSBC Holdings PLC (1.66%), Astrazeneca Plc (1.65%), BASF SE (1.58%), National Australia Bank Ltd (1.49%), Royal Dutch Shell PLC (1.42%), Bhp Billiton Ltd (1.38%), ING Groep NV (1.37%), Australia & New Zealand Banking Group Ltd (1.31%) and Societe Generale (1.29%). The GMO International Growth Equity investment seeks high total return. The fund seeks to achieve its investment objective by outperforming its benchmark, the MSCI EAFE Growth Index (Europe, Australasia, and Far East). This GMO fund typically makes equity investments directly and in non US companies. It may use derivatives or contracts in its portfolio. 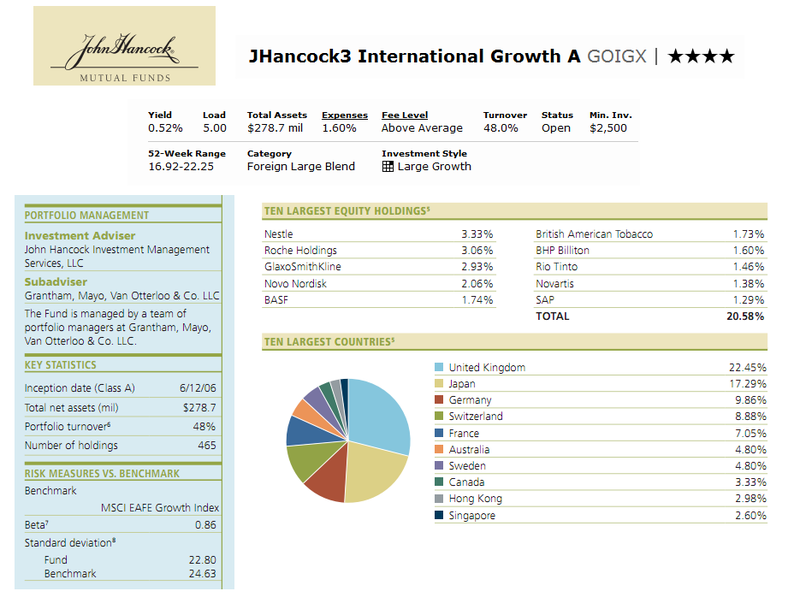 Thomas Hancock has managed this GMIGX fund since its inception in November 2001. This fund has total net assets of $3.46 billion. The annual expense ratio of this fund is quite low (0.65%) compared to the average in the Foreign Large Blend category (1.35%). This fund shares 0.90% dividend yield for the past 12 months. This fund has gotten 5-stars rating from Morningstar. Please check the fund’s prospectus for details. 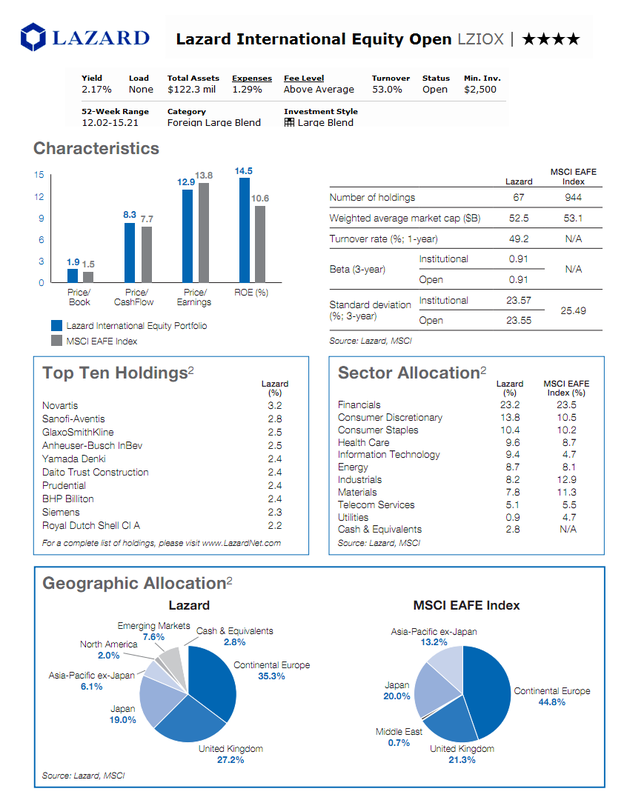 As the top performer, this fund is also best rated fund in this foreign blend category of mutual fund. The Vantagepoint International fund objective is to provide long-term capital growth and diversification by country. The fund invests mainly in the common stocks of companies headquartered outside the United States. It invests >80% of its net assets in foreign equity securities (common and preferred stock), including securities of issuers located in emerging market countries. Investing in equity securities believed to be priced below fair market value at the time of purchase. This Vantagepoint funds has total net assets of $1.26 bilion. The annual expense ratio is 0.98%. This VPINX fund shares 1.81% of dividend yield. This is categorized as no-load fund, as this fund has no 12b1 fee and no sales load fee. This fund is managed by Jane A. Henderson since May 2009. This fund was introduced to public in 1999. But currently the purchased of this fund can only be done at Pershing Fund Center and NYLIM 401(k) Complete. Since 11 years performance after its inception, this fund has recorded 7 years with positive return. The best 1-year total return was recorded in year 2003 with 31.31%. This VPINX fund has returned 19.70% over the past one year and 5.28% over the past decade. The top ten holdings of this fund as of May 2011 are Novartis AG (1.7%), Sanofi (1.6%), Canon, Inc.(1.4%), BP Plc (1.4%), Tesco PLC (1.3%), Vodafone Group PLC (1.3%), Total SA (1.1%%), Telefonica, S.A. (1.1%), Unilever PLC (1.1%) and Takeda Pharmaceutical Co., Ltd. (1.0%). The top five country exposure is Japan (17.5%), United Kingdom (14.3%), France (10.4%), Germany (5.8%) and Switzerland (5.7%). The Lazard International Equity Open fund objective is to provide long-term appreciation of capital. The fund invests primarily in undervalue equity securities, principally common stocks, of relatively large non-U.S. companies with market capitalizations in the range of companies included in the MSCI EAFE Index based on their earnings, cash flow or asset values. The Investment Manager looks for well-known companies in economically developed countries and may invest <30% of assets in securities of companies whose principal business activities are located in emerging market countries. The fund typically invests >80% of assets in equity securities. John R. Reinsberg has managed this fund since October 1991. Nevertheless this Open Class fund was introduced to public in January 1997. The fund has 1.29% of annual expense ratio. This LZIOX fund is under the management of Lazard Assets Management LLC. It distributes 2.15% dividend yield over the past 12 months. Should you are interested to invest in this fund, kindly note that there is 0.25% 12b1 fee but there is no sales load fee. The minimum balance to open a brokerage account in this fund is $2,500. Same amount applies for retirement (IRA) account. Both accounts require a minimum subsequent investment of $50. This LZIOX fund has gotten 3-stars rating from Morningstar for its 9 years positive return performance since its inception 13 years ago. The best return was recorded in 2003 with 29.29%. This fund has 5.75% YTD return. It has returned 17.39% over the past year and 1.64% over the past five years. The other class of this Open Class is Institutional Class (Ticker: LZIEX). This LZIEX class has annual expense ratio of 0.98%. As of June 2011, this LZIOX fund has 67 total holdings. The top ten holdings are Novartis (3.2%), Sanofi-Aventis (2.8%), GlaxoSmithKline (2.5%), Anheuser-Busch InBev (2.5%), Yamada Denki (2.4%), Daito Trust Construction (2.4%), Prudential (2.4%), BHP Billton (2.4%), Siemens (2.3%) and Royal Dutch Shell Class A (2.2%). 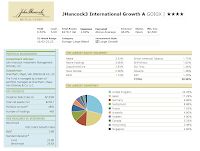 The JHancock3 International Growth fund is seeking high total return primarily through capital appreciation. The fund invests at least 80% of its total assets in equity investments. It typically invests in a diversified portfolio of equity investments from a number of developed markets outside the U.S. This fund is actively managed fund. Please check the details in the fund’s prospectus for additional information. The fund manager of this fund is Thomas Hancock. He has been managing this fund since its inception in June 2006. The expense ratio of this fund is 1.60% every year. Investor can choose to invest either in brokerage or retirement (IRA) account of this fund with minimum initial investment of $2,500. There is 0.30% 12b1 fee and 5.00% front-end sales load fee. This fund shares 0.51% dividend yield. Investor can choose the other classes of this fund such as Class B (GONBX), Class C (GONCX) or Class Institutional (GOGIX). This fund has 5.65% YTD return. This fund has recorded 3 years with positive return with the best return in 2009 with 21.08% and 1 year of negative return in 2008 with -37.48%. This GOIGX fund has returned 22.81% over the past year and 2.62% over the past five years. Currently there are 73 brokerages in which this fund can be purchased. 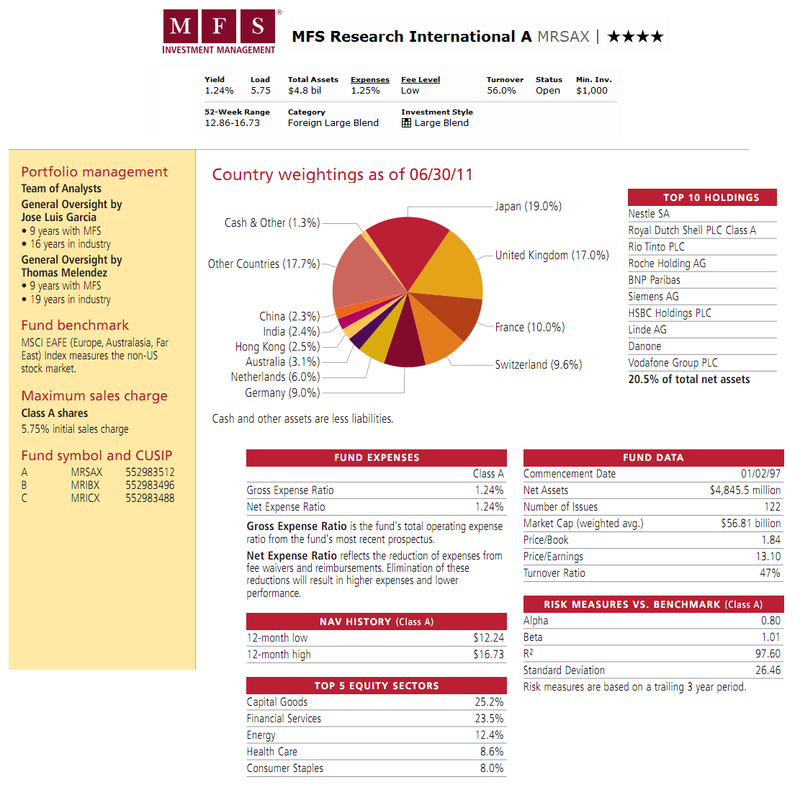 This fund has a total of 465 holdings as of June 2011. The ten largest equity holdings are Nestle (3.33%), Roche Holdings (3.06%), GlaxoSmithKline (2.93%), Novo Nordisk (2.06%), BASF (1.74%), British American Tobacco (1.73%), BHP Billton (1.60%), Rio Tinto (1.46%), Novartis (1.38%) and SAP (1.29%). These ten companies represent 20.58% of total portfolio. 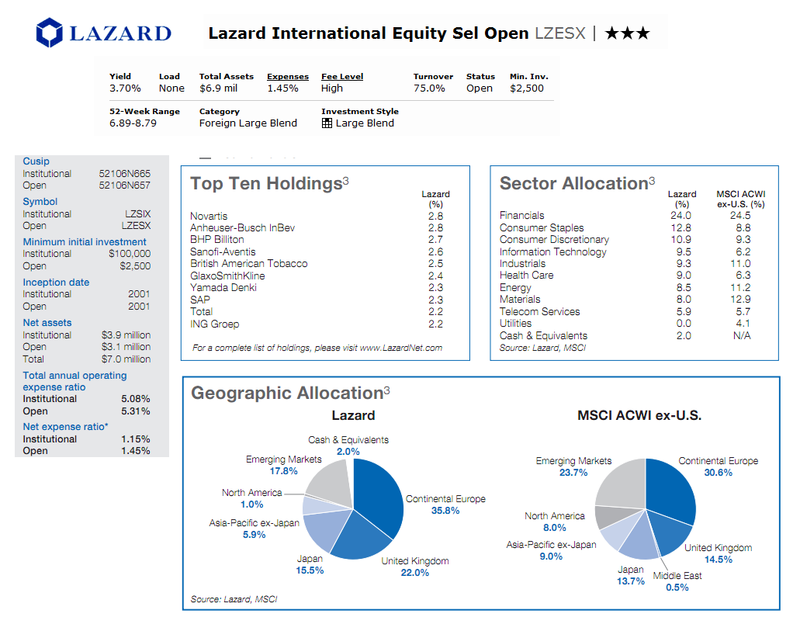 The Lazard International Equity Select Open fund seeks long-term capital appreciation. The fund invests mainly in undervalue equity securities, including ADRs, GDRs and common stocks, of relatively large non-U.S. companies with market capitalizations in the range of companies included in the MSCI EAFE Index. This Lazard fund invests >80% of assets in equity securities and may invest <30% of assets in emerging market countries companies. 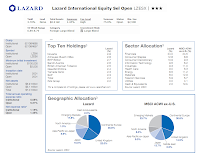 This Lazard International Equity Select Portfolio fund has been managed by John R. Reinsberg and team. John is also the Deputy Chairman of Lazard. This fund has 1.45% annual expense ratio. The minimum balance required for opening brokerage or retirement (IRA) account is $2,500 with $50 minimum subsequent investment. There is 0.25% 12b1 fee but there is no sales load fee. This fund distributes 3.68% dividend yield this year. The LZESX fund has recorded 7 years with positive return within the 9 years performance since its inception. Morningstar has rated this fund with 3-stars rating. It has 5.61% YTD return. The fund has returned 17.40% over the past year and 4.54% over the past decade. 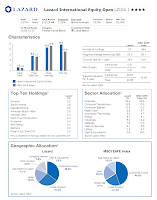 The other class of this fund is the Institutional Class (LZSIX) with 1.15% annual expense ratio. The top three sector allocation of this fund is Financials (24.0%), Consumer Staples (12.8%) and Consumer Discretionary (10.9%). 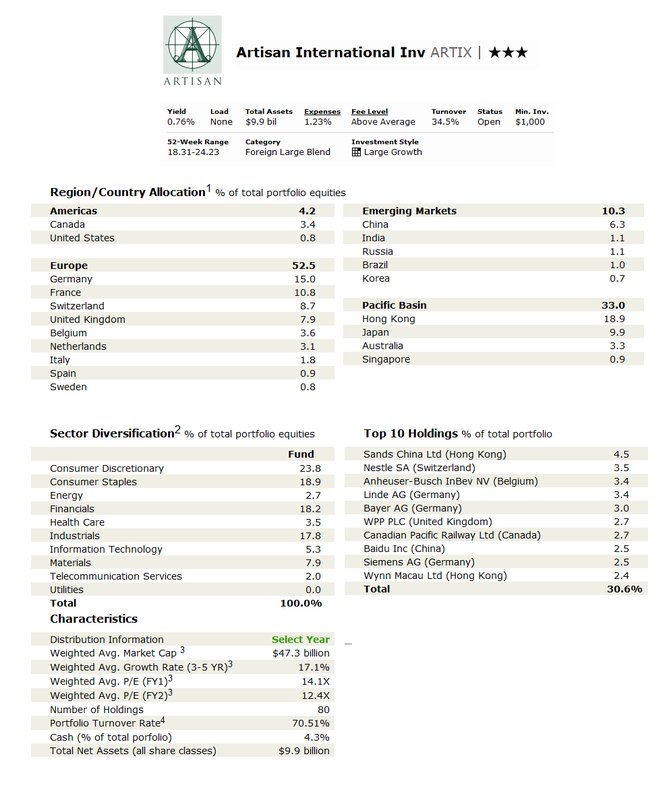 As of June 2011, this fund has 60 holdings. The MFS Research International fund objective is to provide appreciation of capital. The fund invests mainly in foreign equity securities, including emerging-market equity securities. It may invest in the stocks of growth companies, value companies, or in a combination of growth and value companies. The fund may invest in companies of any size and may invest a relatively large percentage of the fund’s assets in issuers in a single country, a small number of countries, or a particular geographic region. 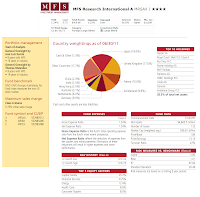 This MFS fund has been under the management of Jose Luis Garcia since May 2005, although the MRSAX fund was incepted on January 1997. This fund has 1.25% annual expense ratio which is a bit lower than the average in the Foreign Large Blend category (1.35%). It has total net assets of $4.85 billion. Morningstar has rated this fund with 4-star rating. The comparison between the years of positive and negative performance since its inception is 9 and 4. Among the 9 years of positive return, the best 1-year total return was achieved in 1999 with 51.22%. This fund has 2.95% 5-year average return. This fund has returned 21.00% over the past year and 6.93% over the past ten years. To start investing in this fund, you will need a minimum of $1,000 for brokerage account and $250 for retirement (IRA) account. This fund applies 0.25% 12b1 fee and 5.75% front-end sales load fee. The other classes of this fund are Class B (MRIBX), Class C (MRICX), RI Shares (MRSGX), R2 Shares (MRSRX), R3 Shares (MRSHX), R4 Shares (MRSJX), 529A Shares (EARSX), 529B Shares (EBRIX) and 529C Shares (ECRIX). The top country weightings of this Research International fund per June 2011 are Japan (19.0%), United Kingdom (17.0%), France (10.0%) and Switzerland (9.6%). The top ten holdings as of June 2011 are Nestle SA, Royal Dutch Shell PLC Class A, Rio Tinto PLC, Roche Holding AG, BNP Paribas, Siemens AG, HSBC Holdings PLC, Linde AG, Danone and Vodafone Group PL. The PIMCO International StocksPLUS TR Strategy Fund (Unhedged) seeks total return which exceeds that of its benchmark index consistent with prudent investment management. The fund typically invests substantially all of its assets in non-U.S. equity derivatives, backed by a portfolio of Fixed-Income Instruments. It may invest in common stocks, options, futures, options on futures and swaps. The fund may invest <10% of total assets in high-yield securities. It may also invest < 10% of total assets in preferred stocks. The fund is non-diversified fund. William H. Gross has personally managed this fund since its inception in November 2006. Bill Gross is the founder, managing director as well as the co-CIO of PIMCO. The annual expense ratio of this PIMCO fund is 1.04%. It distributes 9.26% dividend yield for the past 12 months. This figure is the highest off all that are mentioned in this article. The last dividend was distributed in June 2011 (0.08%). This fund applies 0.25% 12b1 fee and 3.75% sales load fee. This PPUAX fund has 5.04% YTD return. It has returned 20.19% over the past year and 5.16% over the past three years. This fund has experienced 3 years in positive return (best achievement was in 2009 with 42.06%) and 1 year in negative return (in 2008 with -42.86%). This fund is not available in retirement (IRA) account. To start investing in the regular brokerage account, you will need a minimum of $1,000 with $50 for the subsequent investment. This PPUAX fund is available for purchase from 52 brokerages. Investor may choose the other classes of this fund such as Class C (PPUCX), Class D (PPUDX), Class P (PPLPX), Institutional Class (PSKIX) and Admin Class (PSKAX). The top sectors of this PPUAX fund as of June 2011 are Financials (2.4%), Industrials (13%), Materials (11%), Consumer Discretionary (11%) and Consumer Staples (10%).